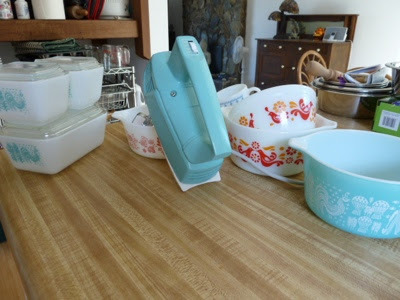 My Home and Garden: I have become a nut for 50's vintage pyrex and cookery. 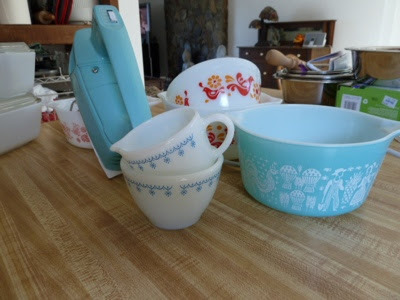 I have become a nut for 50's vintage pyrex and cookery. When I was in Hawaii, my sister and I spent the mornings on eBay. Yes, I know how funny it is to be in Hawaii and spending ANY time on a computer. 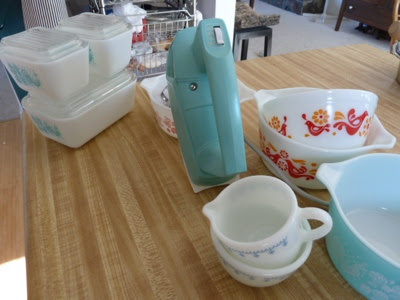 That said, I found a few pieces of pyrex, but my fave is this old school turquoise GE electric mixer. 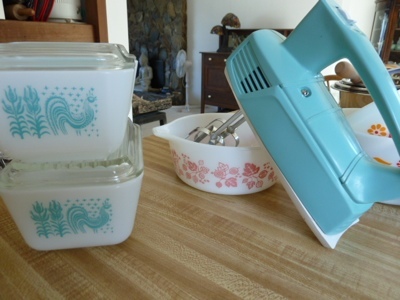 I learned to cook with my Mothers mixer just like it. This one was dirty but I've cleaned it up and it looks and works great!!! You would get on so well with my daughter who was born in the late 60s and seems to know more about the decade than I do. Well perhaps Myra would not agree as I am always being accused of still living in those days. Erin - I'm not specifically into Pyrex but I've been collecting glassware and getting rid of plastics for years now. Have already been thru cancer and am trying to get rid of things and foods that cause cancer. I won't even let my two stray cats, who adopted me, eat out of plastic. I also like a lot of the tin/metal things my mother has and since her death on New Years Eve, some of that stuff has been coming home with me. Hi SRR. It feels good to get rid of plastic doesn't it. Oh...the day I got rid of my microwave was a thrill too. It just feels so good to eat well and safe. I love it that your cats don't eat out of plastic. Mine too!! Tonight we picked beautiful lettuce out of the greenhouse and kale out of the garden. My husband calls it foraging. Don't you love it? !